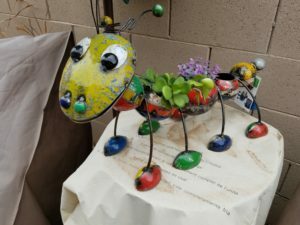 Funky Caterpillar and metal artwork is the new normal for outside decorations, I love some of the new stuff including this Caterpillar. Nice planter and decorative at the same time. Adds a little color to the home and you don’t have to have any real bugs. You know you can always call ProBest Pest Management 480-831-9328 if you see any critters within your home? I don’t mind these decorations but no sense in living with the bugs. I have seen decorative rock, wire ants and even birds and flowers. What kind of artwork is at your home?